I wish you could’ve smelled my house yesterday. 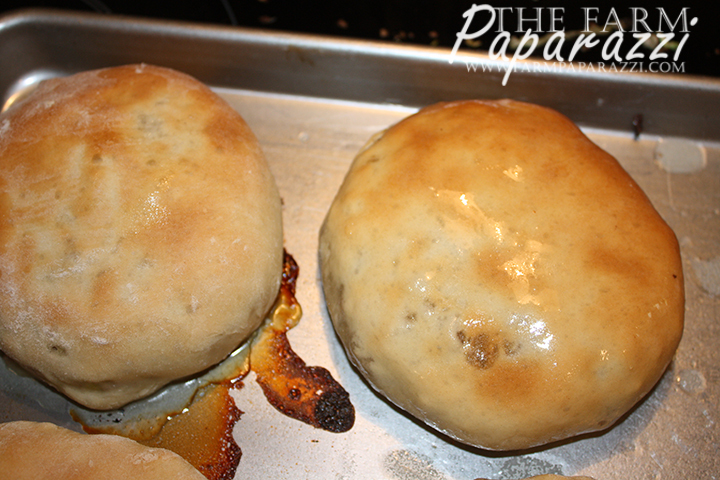 It smelled heavenly from my baking frenzy of cabbage burgers and cinnamon rolls. 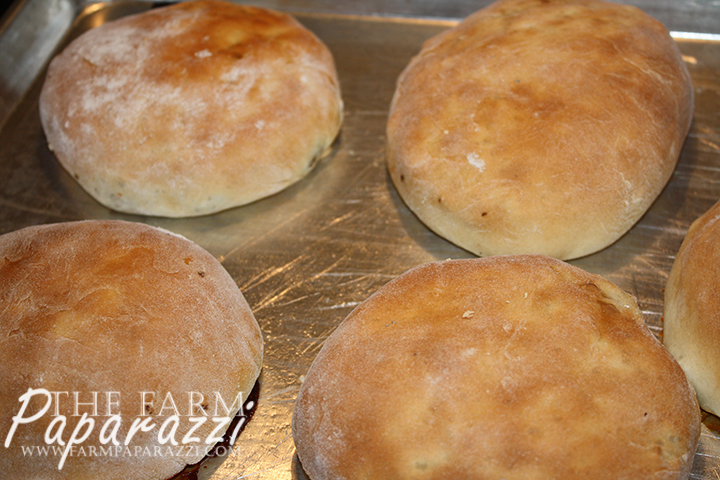 The mixture of fresh-baked bread, savory meat/cabbage mixture and sweet sugar ‘n cinnamon would make anyone drool. Let me preface this recipe by saying, I’m sorry to my fellow OCD sisters and brothers out there. These instructions will include a lot of “just eyeball it” instructions. 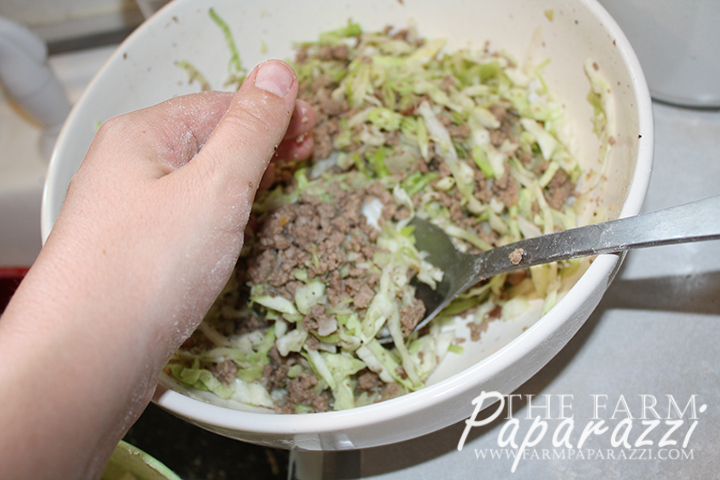 It’s taken me many batches of cabbage burgers to get a “feel” for how I like them. I’ll do my best to share tips and suggestions. Don’t be scared! It’s totally worth it in the end. You and I will get through this together. Okay, now that’s out of the way, we can get down to the business of creating awesomeness. 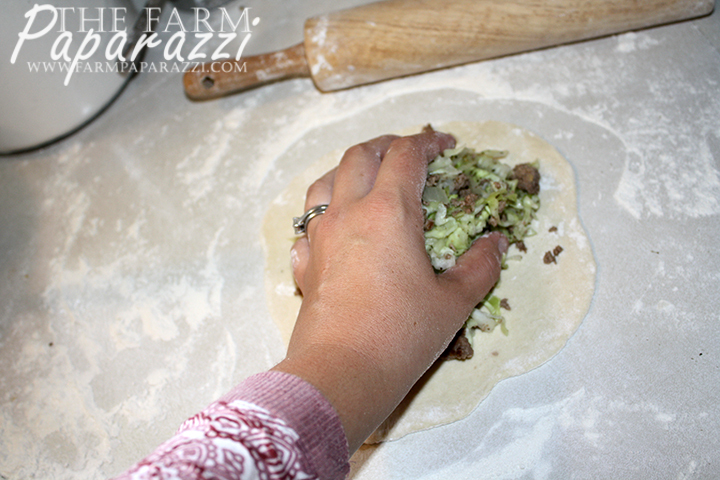 To get started, I harvested two heads of cabbage from the garden and made a double batch of the Easiest Roll Dough the day before I made these. 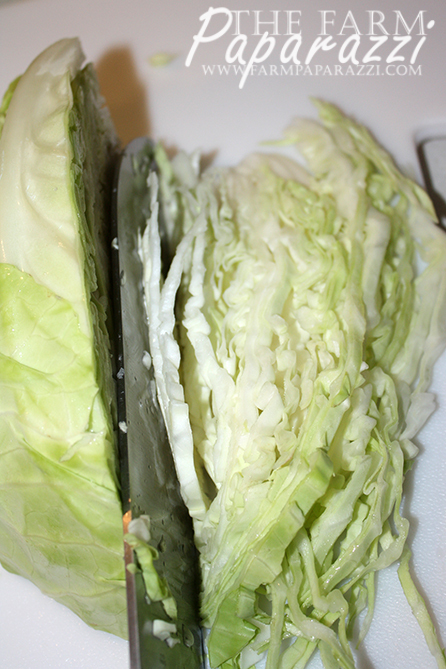 For cabbage burgers, I do the slice method mentioned in the video. Make sure to use a good, sharp knife. 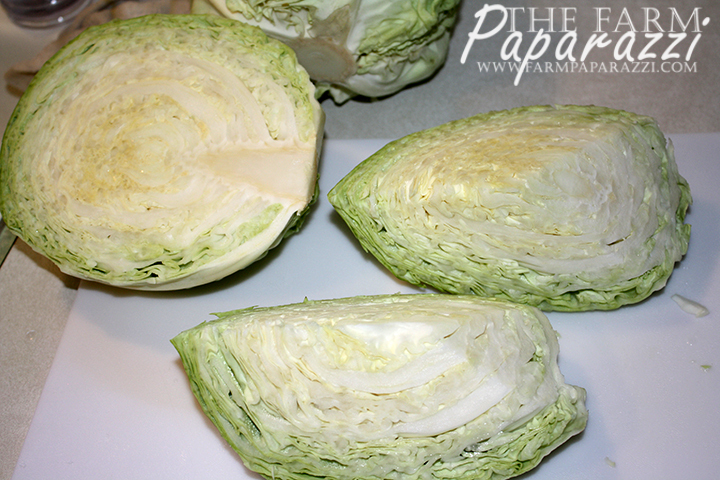 I also am slightly picky about the texture of the cabbage I use, so I also tear out any big, hard veins I find. 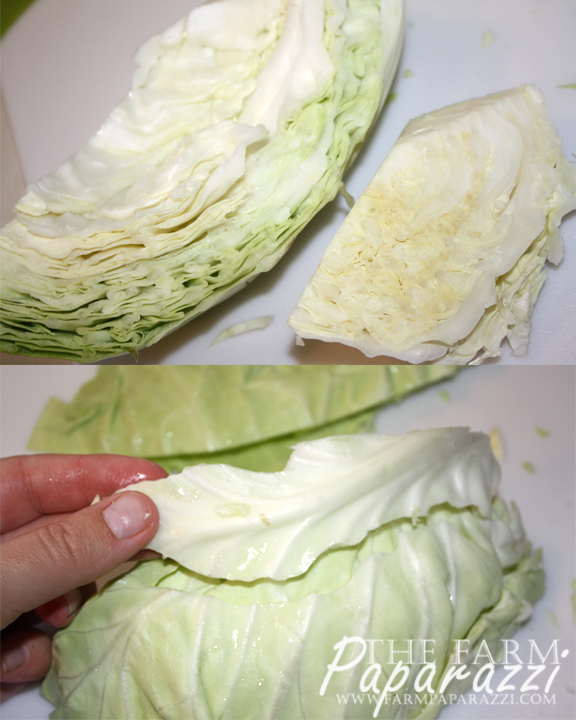 These cabbages were pretty large, so after I cut off the core, I also took out the centers, which was a lot of the thick, veiny stuff anyway. 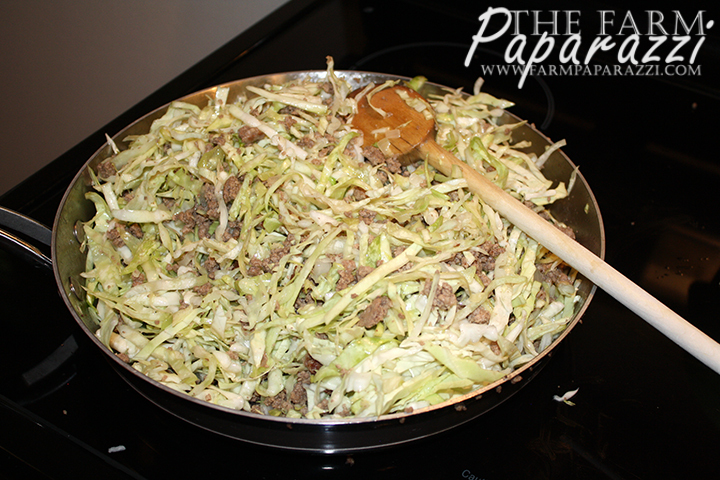 With cabbage all ready to go, it’s time to brown the ground beef in a large skillet over medium high. 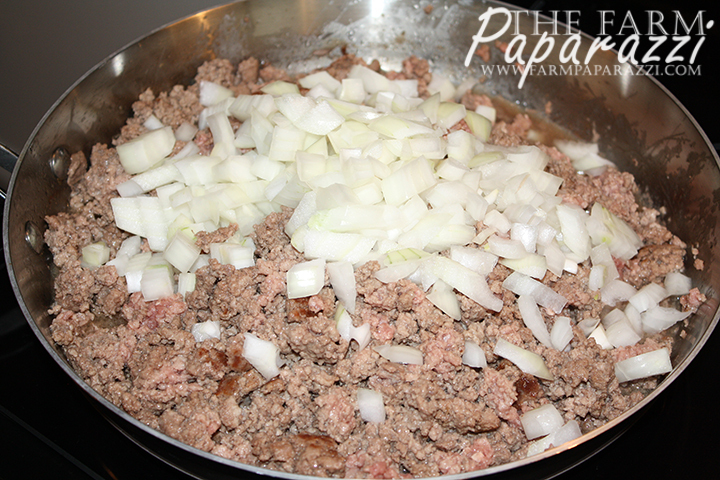 Add the onion when the ground beef is mostly browned, but still slightly pink. That way the onions won’t get overcooked. 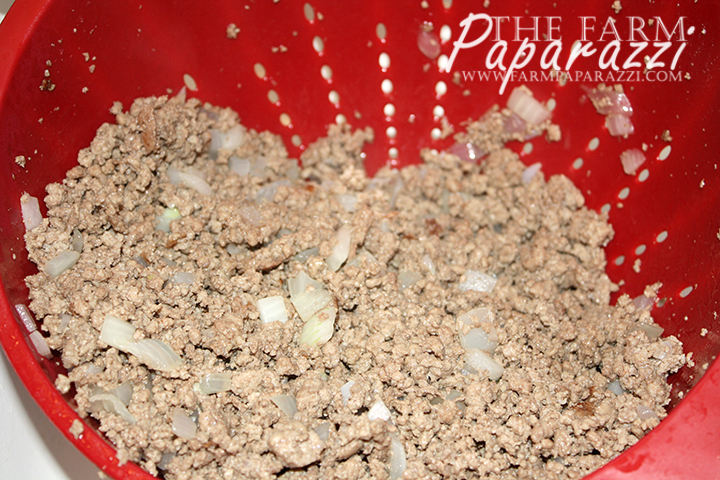 When the ground beef is completely browned (no pink), turn off the heat and drain any excess fat. I put a small glass dish over my sink drain and place my colander on top of it to catch the fat. That way it won’t go down the drain and clog things up. 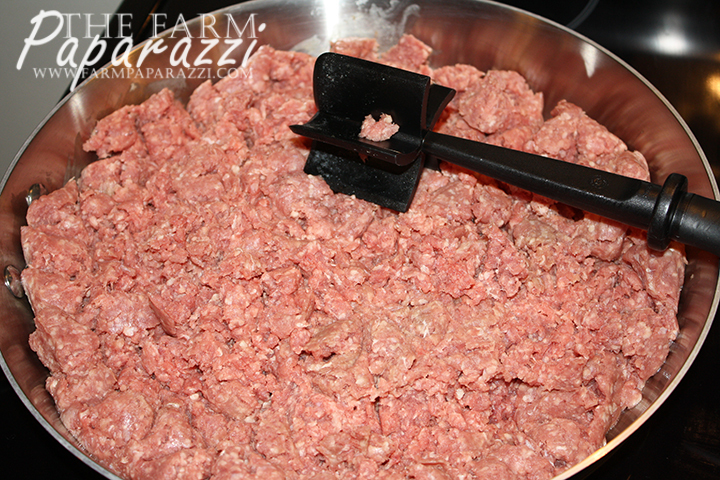 Pour the ground beef back in the skillet and season with Canadian steak seasoning or your choice of preferred seasoning. DON’T turn the heat back on. 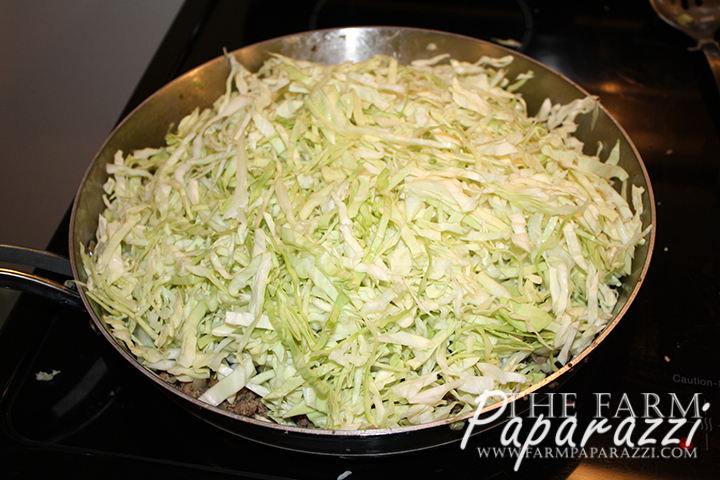 Add the cabbage to the skillet (or if there’s not enough room, mix together in a large mixing bowl). It will look like a LOT of cabbage, but don’t be alarmed. It will wilt down. 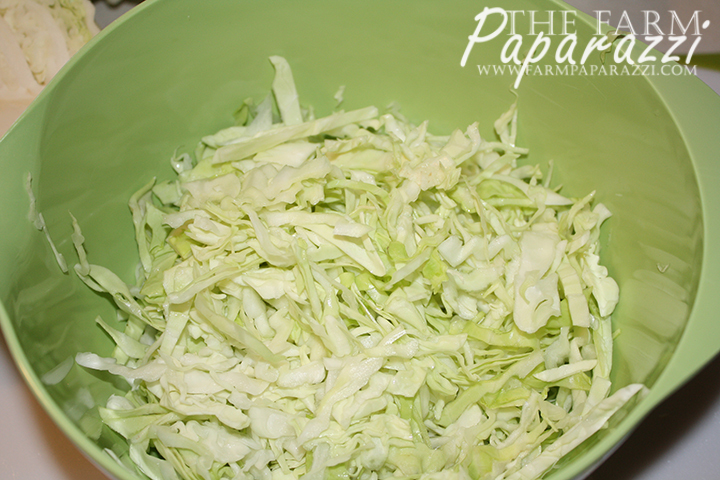 Plus, lots of cabbage means moist, delicious Cabbage Burgers. 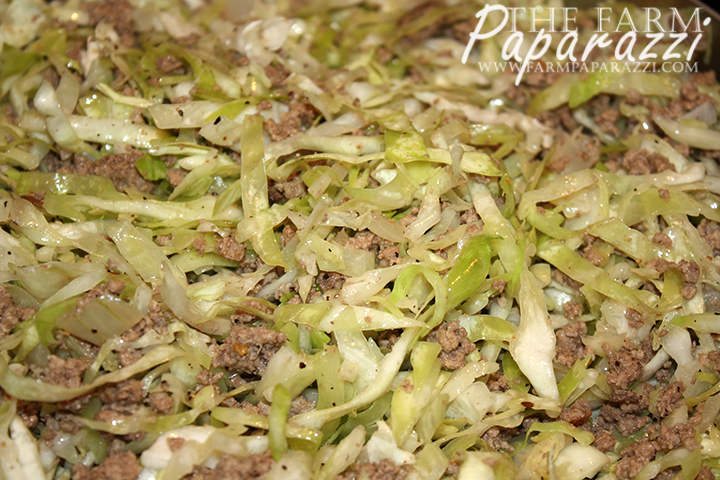 The heat from the beef mixture will be enough to wilt down the cabbage. Let it cool in the skillet or transfer to a large bowl to cool. You might want to stick it in the fridge to be safe. Sometimes I do that and finish making the cabbage burgers the next day. 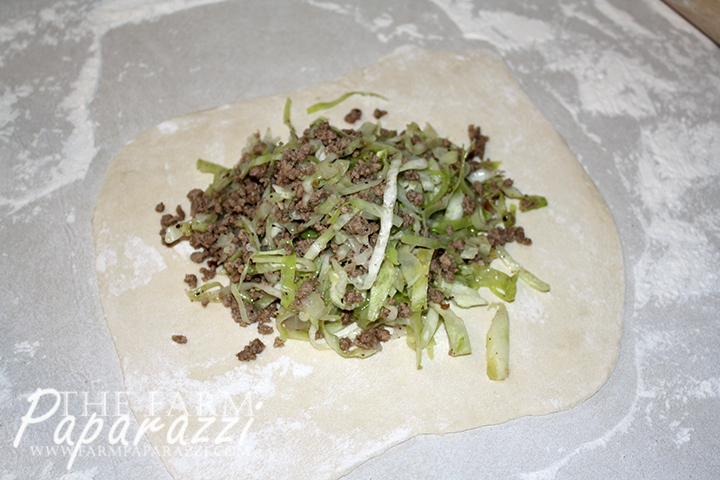 Once the cabbage/meat mixture is completely cooled, pull out your roll dough. 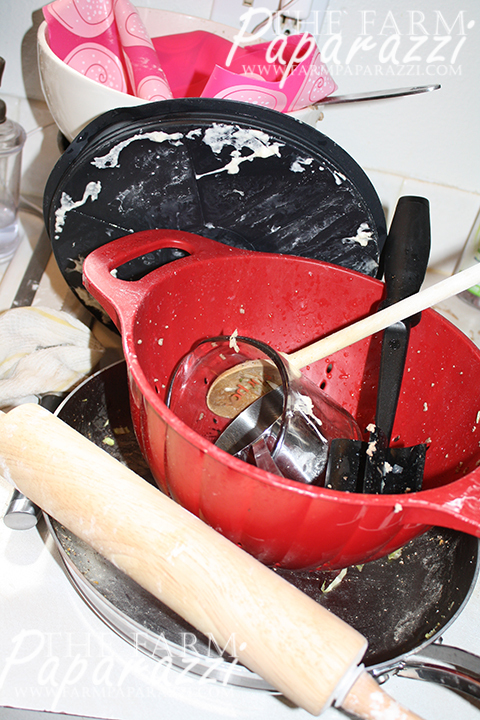 If you used my recipe, it’ll look like this. 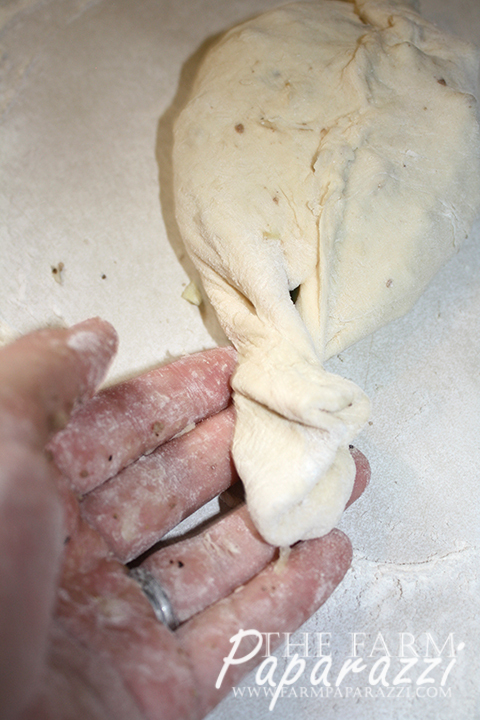 Using your hands, pull the dough away from the sides and form into a large ball. It will be just slightly sticky. 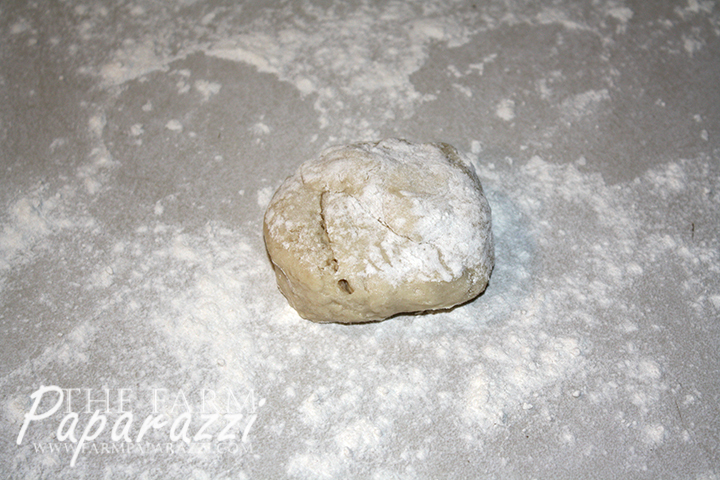 Sprinkle the counter with a light dusting of flour. 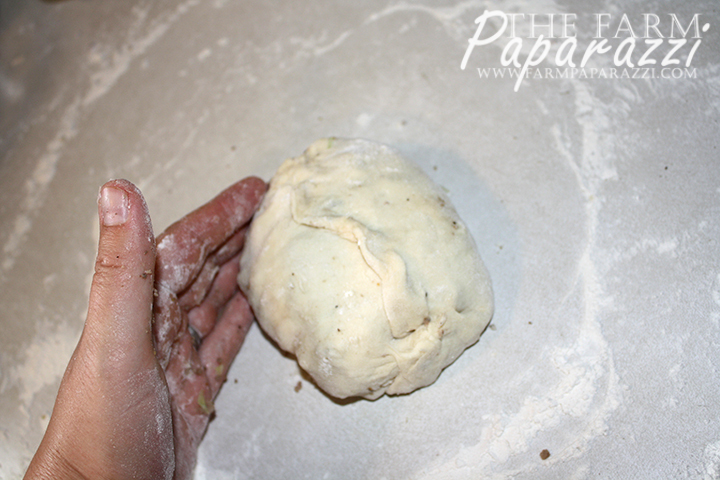 Pinch off pieces of the dough and roll into a rough ball with your hands. 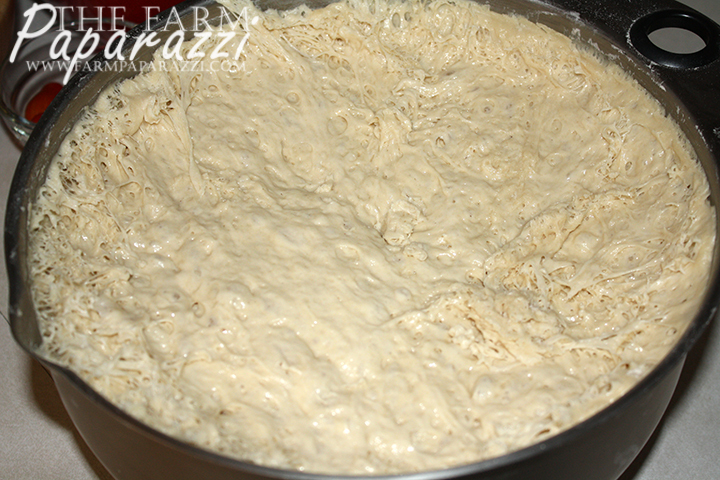 Don’t overwork this dough. It gets tough pretty fast. 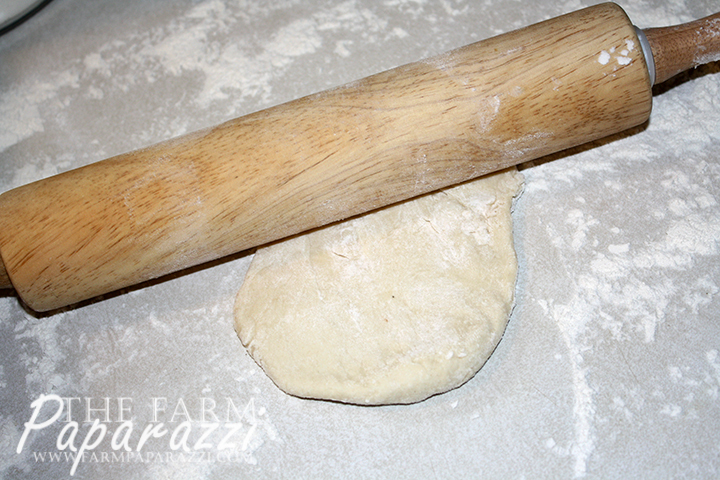 Roll out the dough. Take one long stroke away from you, then one long stroke toward you. 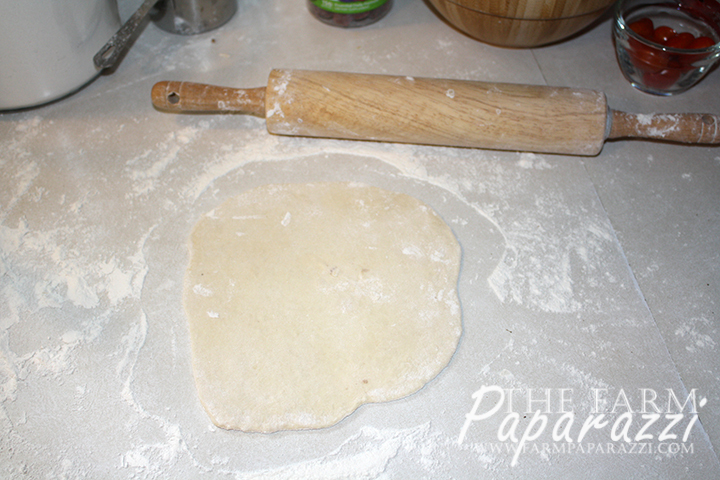 Rotate the dough and repeat, flipping over as needed, until it’s about a 1/4″ thick and about 7-8″ long and 6-7″ wide. This makes a fairly large roll. 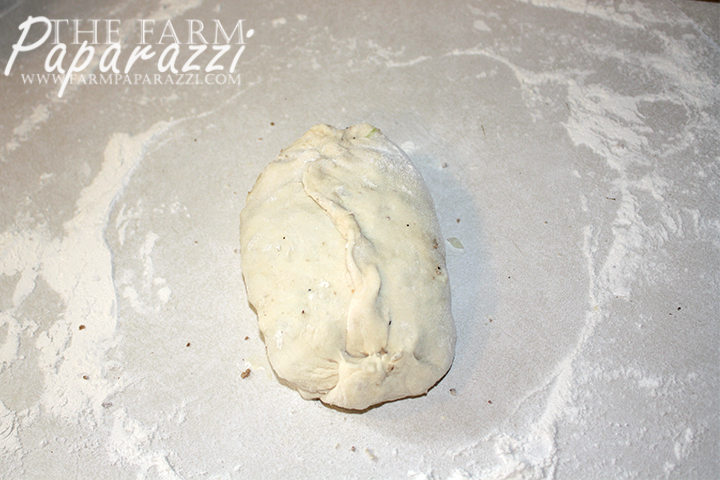 Using a slotted spoon, carefully heap on top of your rolled-out dough. Don’t be stingy! 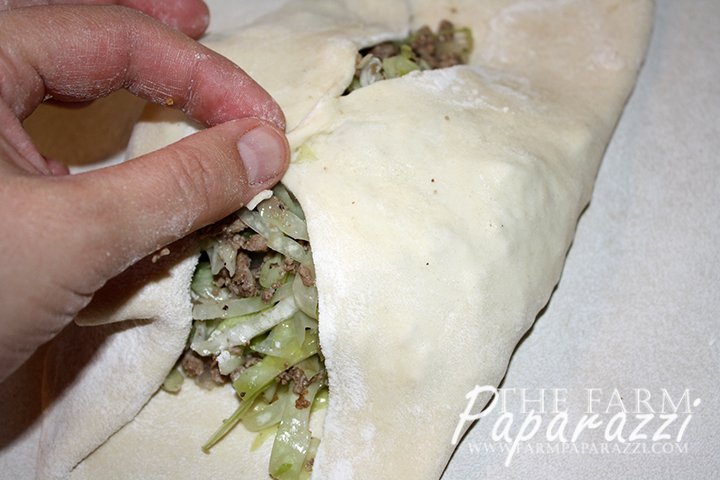 Gently, pull up the long sides of your dough and pinch and twist together. Do this all the way down one end, then work down the other side. 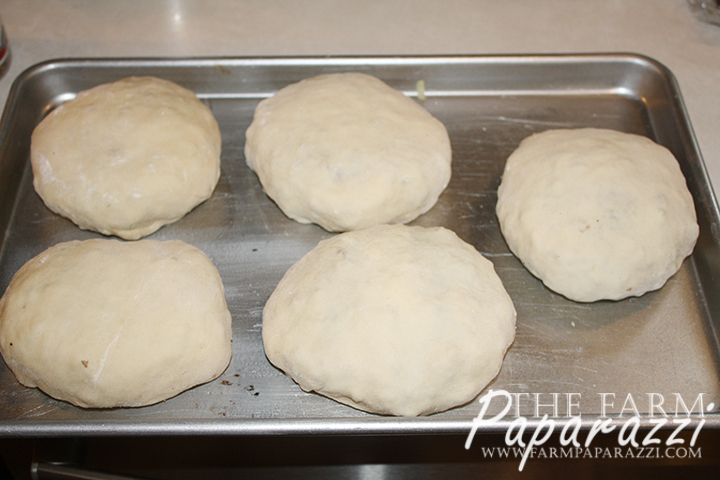 The ends will probably have some excess dough. I tear it off and pinch up the ends to close. I’ve tried re-using the ends and it gets too tough to work with, so I usually toss them when I’m done. 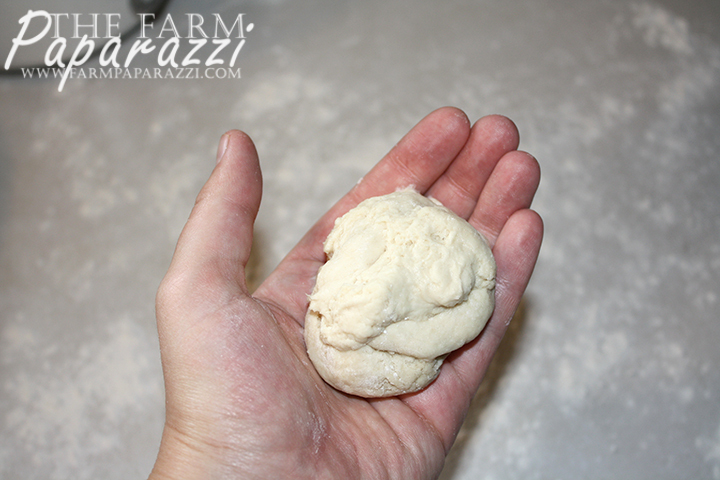 Once the dough is closed around the filling, I use the sides of my hands to gently shape into a round form. 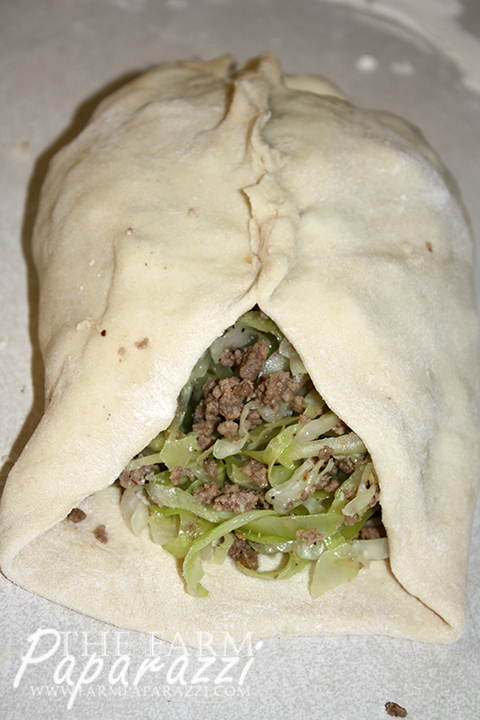 Then I place the cabbage burger seam-side down on a baking sheet lined with a baking mat or sprayed with cooking spray. Put 4-5 on a sheet, careful not to overcrowd. 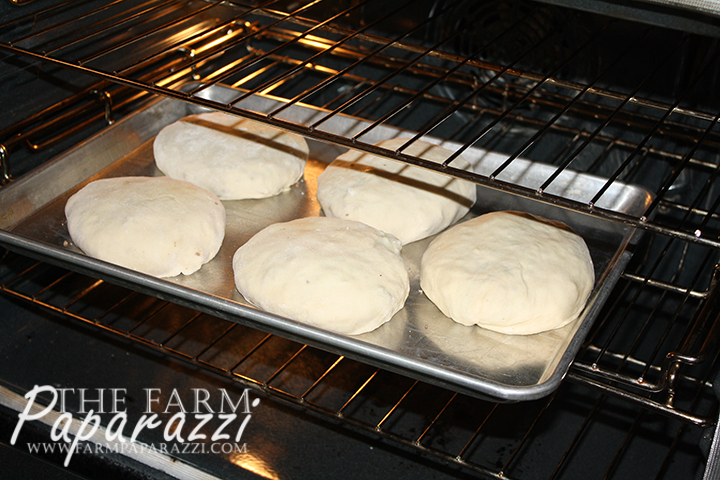 Then cover and let rest for 10-20 minutes to rise slightly. 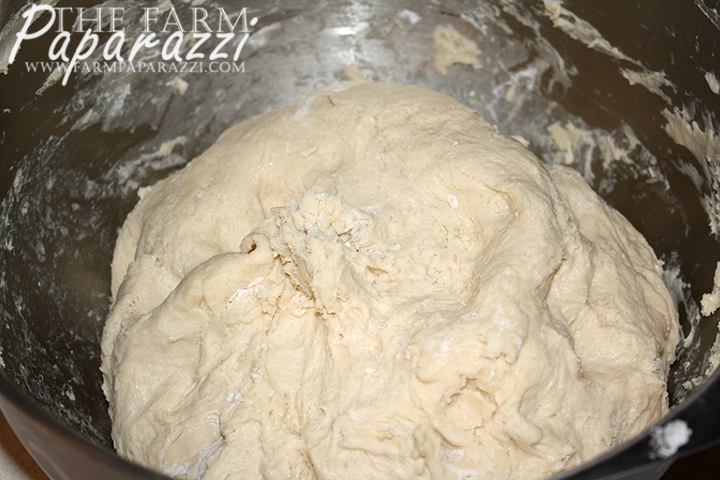 Used up all your filling and have dough leftover? 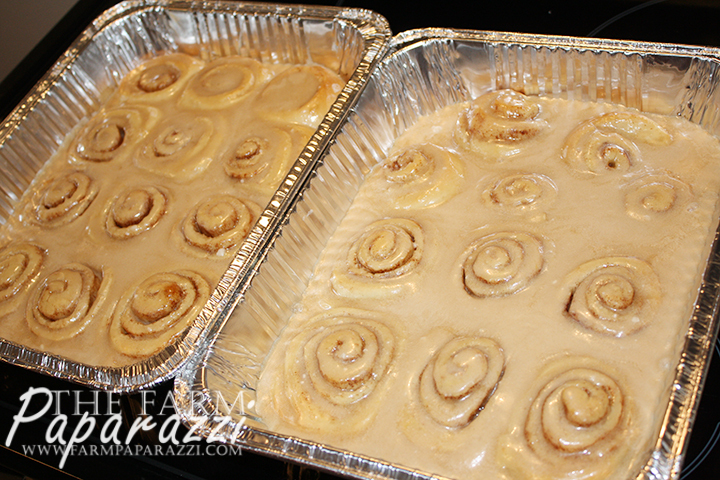 Check out this quick Cinnamon Roll recipe! Bake at 350F until golden brown (about 30 minutes). 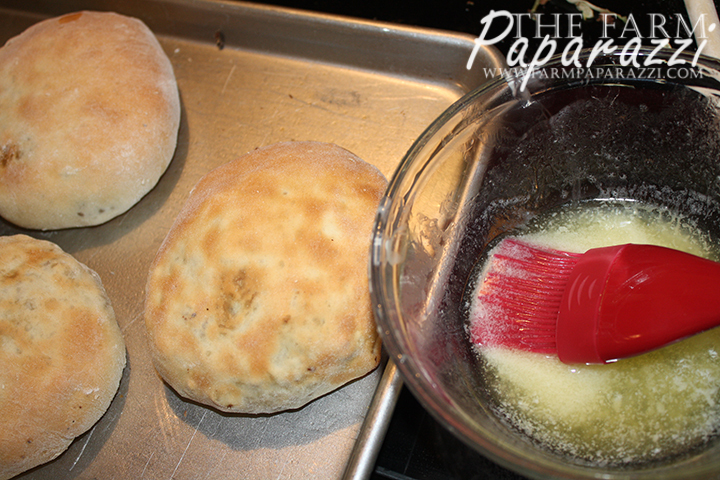 Brush with melted butter using a pastry brush. You can eat them now, or cool for later. To cool, set on wire racks. Once they are mostly cool, place in fridge, uncovered, to completely cool. This will prevent them from releasing steam in bags or containers and getting soggy. 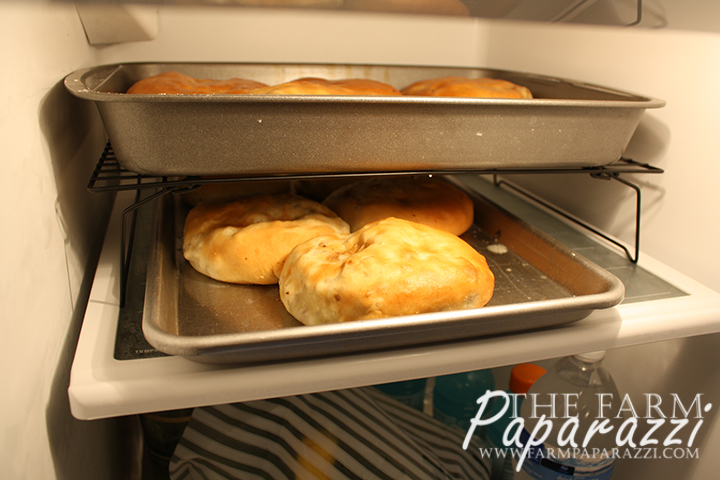 After they are fully cooled, I place them in gallon storage bags and store in the fridge for up to a week. 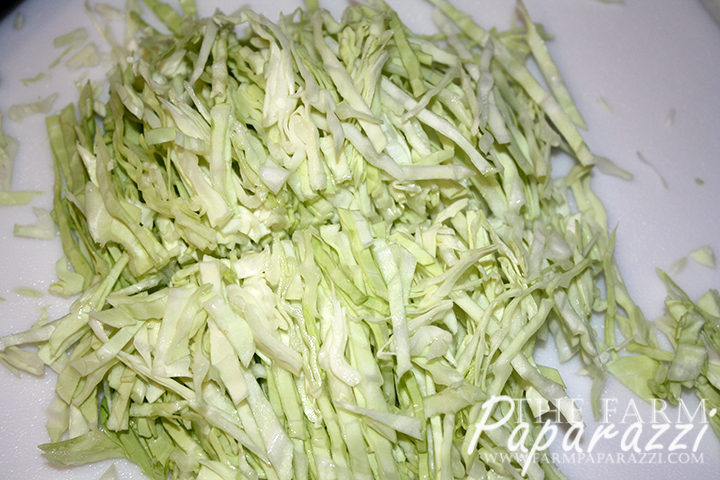 The single recipe makes about eight Cabbage Burgers, depending on the size. I make them pretty big and doubled the recipe, so it produced 15 this time. I also had enough dough leftover to make a batch of Cinnamon Rolls. Now, go do the dishes. Then come to my house and do mine. It’s only fair. I told you how to make the things.